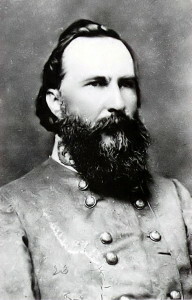 A South Carolinian, Longstreet fought as a Confederate officer in many of the major battles of the Civil War. He was Robert E. Lee’s second in command at Gettysburg, and his reluctance to organize the celebrated “Pickett’s Charge” has often been cited as the reason for Lee’s defeat in this turning-point battle. (Many others, however, place the blame on Lee himself.) After Gettysburg, Longstreet performed brilliantly at Chickamauga in September 1863 and in the Wilderness Campaign. He was with Lee when the general surrendered the Army of Northern Virginia at Appomattox Courthouse in April 1865.